Rava Dhokla, the steamed savory cake made from semolina. Though i have prepared khaman dhokla regularly as our snack for tea time, this rava dhokla is totally new to me until i tried on my own a month before. I have seen this dhokla recipe in blogsphere a lot and i don't know why i haven't tried such a simple and tasty dish so far. 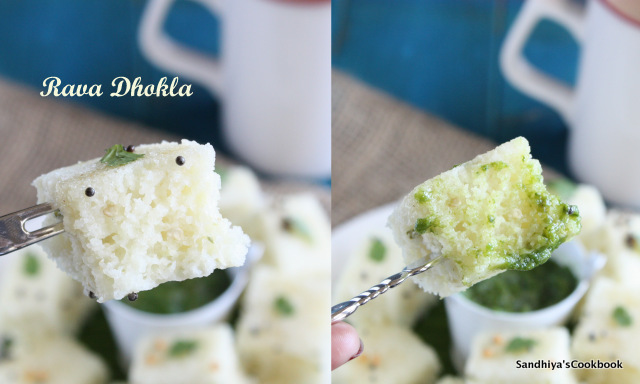 When i had tried this as a snack for evening tea, it became a instant hit in our home.Before trying, I had a doubt that this dhokla may not be as soft as khaman dhokla and i was completely wrong, it turned out so soft and tastes equally good in its own way. Like Khaman dhokla, it can be prepared ahead for a get together or a party and it stays soft for few hours, if needed, warm it in microwave for few secs just before serving.To get a soft dhokla, make sure that the eno salt is fresh and active. Other than that, it's so simple and can be prepared in a jiffy. First take the ginger and green chili, put it in mixie/blender jar and grind into coarse mixture & keep it aside. Take the rava in a bowl, add the curd, ginger&chili paste, salt & sugar. Mix it well, then add the water and make it as thick batter. Cover the bowl with lid and let it aside for 30 mins. Take the eno salt. Measure and add the eno salt & lemon juice, now it became frothy. Mix it all well together. Now take the pan and greased it well with oil and pour the rava batter into it. Steam it in the steamer for 8-10 mins. Or cook until the tooth pick inserted in the center comes out clean. Flip the pan upside down on the plate and tap gently, the dhokla will easily come out, then cut into desired shape. Let it cool a bit, in the mean temper the ingredients listed under "To Temper" and add it on the top. Serve it with green chutney. Adjust the amount of green chili & ginger according to your taste. Instead of grinding the chili and ginger, you can chop them finely also. Even you can steam it in pressure cooker/pan without whistle. I don't have dhokla plate, so used my baking tray. Absolutely irresistible, those porous dhoklas squares tempts me a lot. Feel like finishing that plate. Awesome colour and the texture looks amazing..so nicely done Sandhiya..enjoyed your series! Excellent picture composition and props. Love how the dhokla looks. Thanks, give it a try, i would love it for sure. 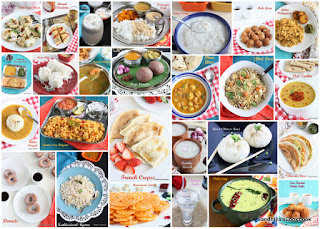 Mmm love the pics and the dhokla looks delicious. This rawa dhokla was my lunch twice a week , but I haven’t made it since long , Love the way these Dhokla’s have turned out , nice and spongy . wow soft and spongy. I love the cream colour, it adds even more richness to the dish. Nicely done.